It's crunch time, but you're running out of gas. Time to give up? Nah, not you. It's time to shift into Beast Mode. Beast Mode Black from Beast Sports Nutrition is the most intense pre-workout matrix on the market and is the ideal solution when you're running on fumes. Beast Mode Black is only for serious, healthy athletes and it can help you push your body and mind to their limits so you can power through the most intense workouts. It contains 400 mg of caffeine that's balanced out with Teacrine, so you get the energy and focus to push yourself to new heights without the dreaded crash and burn. Beast Mode Black will ignite your drive and get you back on your feat and trucking the competition. 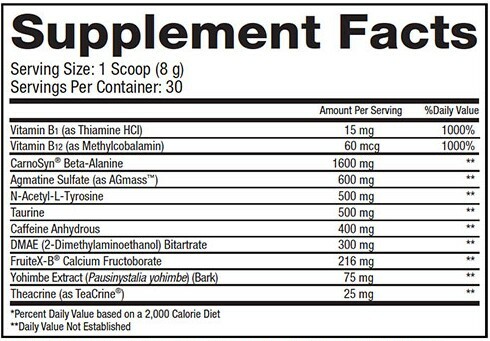 As a dietary supplement, use one (1) level scoop with 12 fl oz of water 15-20 minutes prior to workout. Do not exceed maximum serving size of (1) level scoop per 24 hour period. Do not take with any other products that contain caffeine or any other stimulants. Check with a qualified healthcare professional before using this product, or any dietary supplement, if you are under the age of 18 or if you have any known or suspected medical condition(s) and/or are taking any prescription or OTC medication(s) and/or if you are pregnant or nursing. Discontinue use two weeks prior to surgery. Discontinue use and consult your health care professional if you experience any reaction to this product. Contains caffeine. Too much caffeine may cause irritability, sleeplessness and occasional rapid heartbeat. To avoid sleeplessness, do not consume within 4 hours of bedtime. Always try to consume at least 64 fl oz of water daily while using this product. Do not exceed recommended serving size. Do not use if seal is broken or missing. Keep out of reach of children.